Provides a long-lasting, watertight seal. For use between bathtub and wall. Self adhesive decorative trim is pre shaped for fast easy installation. It provides a long lasting seal and gives a finished professional look to kitchen and bath areas. 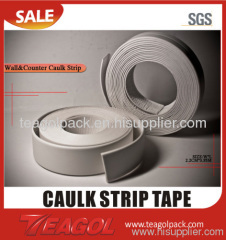 Best of all the mildew resistant caulk strip installs in minutes simply peel and press in place. Available in different colors and sizes, and for other applications.